Zoya Robyn as a base, with Sally Hansen Professional Lavender Cloud as a base for the orange, with CND Electric Orange over it. ALDO Sea You in Ibiza as a base, with ULTA Moody Blue sponged on the tip end. For his body, I used Sally Hansen Trendy Creme, then mixed that with a little American Apparel Hassid to shade. For his spots, I used American Apparel Pinto, which I also used for part of his shell, along with Barielle Unravelled Rust, butter LONDON Minger and American Apparel Manila. For his eyes, I used Sally Hansen Professional Lavender Cloud, OPI Ginger Bells and American Apparel Hassid. Zoya Yummy as a base, with ULTA Moody Blue for the dark blue of the body, shaded with American Apparel Hassid, which I also used in the background and pupils. For the tail fin, I used American Apparel Manila. Zoya Robyn as a base, with Sally Hansen Professional Lavender Cloud as a base for Nemo's body, topped with CND Electric Orange, then shaded with American Apparel Pinto, then outlined the stripe with American Apparel Hassid. Zoya Yummy as a base, with Orly Mirror, Mirror for the head, shaded with Orly Mirror, Mirror mixed with American Apparel Hassid, which I also used for the eyes, then highlighted with Essie Bone Chilling White. For the beak, I used butter LONDON Minger, shaded with OPI Ginger Bells. Orly Gumdrop as a base, with ULTA Moody Blue for the main blue, mixed with Zoya Yummy to highlight, and American Apparel Hassid to shade. For the white, I used Sally Hansen Professional Lavender Cloud. ULTA Moody Blue as a base, with Orly Lollipop for the body, with Barielle Grape Escape to shade, Sally Hansen Professional Lavender Cloud and Zoya Yummy for the eyes. Zoya Yummy as a base, with American Apparel Manila for his body, butter LONDON Minger to shade, Sally Hansen Professional Lavender Cloud for the eyes, and American Apparel Butter to highlight. There is a few lines of Barielle Unravelled Rust in there too to define the fin and belly. Zoya Robyn as a base, with Sally Hansen Professional Lavender Cloud for his face, shaded with Orly Mirror, Mirror, American Apparel Hassid for the black, and American Apparel Manila for the yellow on the white stripe, and on his 'nose'. Don't forget... P. Sherman, 42 Wallaby Way, Sydney. i am not a person to comment on blogs etc, but finding nemo is one of my favourite movies and this design is divine... it is wonderfully done!! i'm impressed :) keep up the good work!! oh sooo cute! I love Finding Nemo and I LOOVVEE Ellen!! I'm excited to see your last manicure! It will definitely be a bitter-sweet experience for me.. This is beyond cute. Your artwork is amazing!!! This is awesome. You're so talented! Will you still be blogging after your 365 days are up? I hope you continue to 'cause I love seeing your work! AMAZING!!!!!!!! I'm a HUGE fan of Finding Nemo and especially the 'just keep swimming' line and couldn't stop screaming when I saw this design! I'm a definitely going to try this out! I love it! Aw Finding Nemo! The movie is amazing! OMG! I LOVE LOVE LOVE Finding Nemo. Great Mani for me to wake up to. Thanks hun! Now I think I am going to have to watch this today. NOOOOOOOOOOO!!!!!!!! TOMORROW CAN'T BE THE LAST DAY!!!!!!!!! SAY IT ISN'T SO! Finding Nemo is my favourite movie everr! 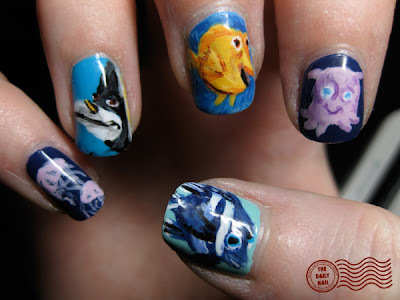 That is the cutest mani everr! I can't believe that tomorrow's the 365th day already! Geez, time flies! WOW, your talent keeps me completely in awe! AMAZING! Where will my morning be w/o your brilliant designs?? Thanks for sharing your great ideas- Congratulations on all your hard work! Cris... so don't read them. Wow can you please tell me how you are able to paint on your dominant hand with your non-dominant hand, or are you ambidextrous? Can you also show a picture with your painting tools? Your work is seriously awesomely amazing! Okay, this is totally my favorite. Hands down. LOVE LOVE LOVE. Love the design, and I LOVE Nemo! But, after the 360 days, are u still going to do nail designs???? So awesome! I have been so inspired by your blog this past year. I am so sad that your challenge is up and I hope that you continue to inspire and post! I come from the reef, and I don't eat beef. This is amazing.. I would never be able to recreate this, but wow. I love the mini masterpiece on your nails! Noassa que pintura maravilhosa parece uma foto.fantastico e uma grande artista. Oh my gosh, this is AMAZING! It is easily my favorite design of yours so far. It is seriously incredible. Yes, I'm biased, as Finding Nemo is also one of my top 3 favorite movies, but still...WOW. Wouldn't blame you a bit for not taking it off! These are my favorite favorite favorite so far! Amazing!! Love it. What tools do you use? Que linda a unha... Embora eu precisei usar o tradutor pra vero que tava escrito. Depois que passarem os 365 dias, você ai continuar pintando as unhas todos os dias? Hi, I am Brazilian and I love your nails they are great inspirations to me! -What tool you use to do the drawings? They are perfect! Kisses! Incredible! The seagull on your pinky is spot on! I can't believe you can do this on such a small canvas, even after seeing you do it again and again for 364 days. You are an inspiriation! What in the world could top these nails??! 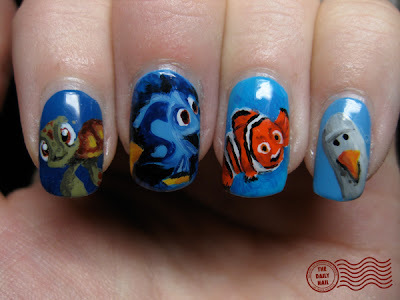 I ♥ so much Finding Nemo!! I've been keeping up with your blog, but just recently became a follower. I can't believe tomorrow is 365! Many of your designs are awesomely fantastic, but this one is great- amazing detail! Amazing, as always!! It's hard to believe that your year is almost up! I hope you get to go out and celebrate - it truly is quite an accomplishment! This is GREAT!!! I love the seagull! ok, 1 more hour...anxiously awaiting your last and final design for this project! so basically i check your website EVERYDAY! well anyways my names leslie and i think what you do is really awsome!! I LOVE how the bird looks in that dumb way like he always does in the movie! u got a fan today....me! Those nails are amazing!!!! 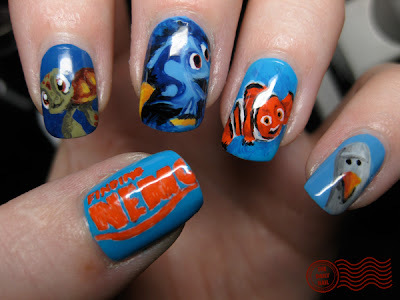 Finding Nemois my favorite movie and the nails just made me love the movie more! Keep up the fantastic work!!! I think you should have done this last! All that hard work and it turned out so well, I can't believe you only wore it for one day ): *sniffle sniffle* Great job as always though!